Portugal has lost one of his best actors yesterday. His name was Nicolau Breyner , he was 75 and he died after a heart attack. He was a cancer survivor (2009). Portugal is mourning but also celebrating his life. Below, you can see a small tribute from ana Moura to Nicolau. To those who do not understand English, and are to lazy to use the translator, she says that she does not want to be in focus as a tribute to someone. But she thinks this music is the best way to say “Thank You” to Nicolau Breyner for his legacy. She dedicates her own song, “Clandestinos Do Amor” that was included on the Original Soundtrack of one of the movies that had Nicolau as an actor: “Os Gatos Não Têm Vertigens”. Beautiful. 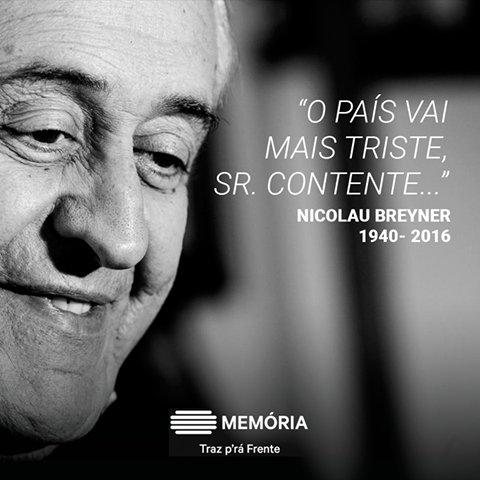 Não gosto de estar em destaque quando decido homenagear alguém mas encontrei nesta música a melhor forma de agradecer ao Nicolau Breyner por tudo o que nos deu e deixou. To those that understand Portuguese, please watch an interview with Nicolau Breyner. Daniel Oliveira is the interviewer. One of the subjects is death. It is emotional.